Add a notification bar with an announcement message to the top of your website to promote deals, news and more. The Website Announcement Bar add-on gives you the ability to draw attention to an important message you want to share with your website visitors. A call-to-action button can also be included in the announcement bar to link users to a specific page. Do you have updates to share with your visitors and members? Do you want to add a new call-to-action (CTA) to your website? You probably do. If that’s the case then an announcement bar would greatly benefit your site! Announcement bars have quickly become a popular tool for websites to draw attention to a specific message. 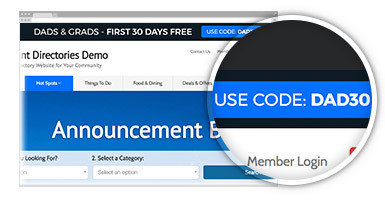 Some sites may use announcement bars to highlight promotions or coupon codes. Others might advertise their next event or promote their newest blog post. The great thing about an announcement bar is that it’s easy to update. It’s only one sentence! This makes it easy and fast for you to cycle through specials and/or links. Posting your most recent offering for your visitors to see only takes a minute.